Students prepare for the exercise by reading about normal faults in the structural geology textbook. The class is divided into groups of 3-5 students. Each group is given two clear plastic shoe boxes, each of which has one end cut off so that one box slides lengthwise into the other box. Students are charged with running three extensional sandbox experiments during the class period, in which they fill the shoe box with sand having different physical properties (ex. grain size, clay content). The groups have access to materials (such as Saran plastic wrap) that can be used to line the boxes and provide different physical properties along the basal detachment. 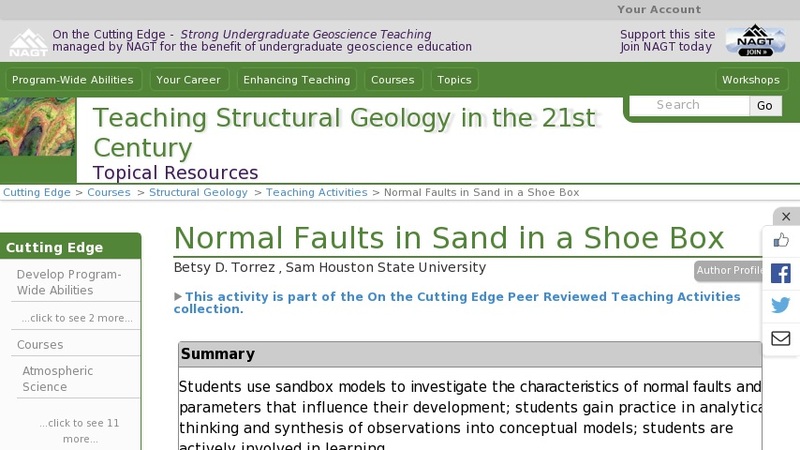 Students are assigned three main tasks: to explore a variety of physical parameters that may influence the characteristics of normal faults in analog models, to observe typical geometry and kinematics of normal fault development in an extensional setting, and to draw inferences and form hypotheses about the general controls on normal faulting. Students take notes on the conditions of each experiment, then write brief descriptions of geometric characteristics of the faults. They are asked to evaluate which observations appear to be repeatable from one experiment to another. After the groups have finished running experiments and taking notes, the class reassembles for an instructor-led brainstorming session. The instructor makes a list of student-generated observations, key parameters, and possible inferences on the board. The instructor leads the class in a discussion that addresses issues such as the key characteristics of normal faults, kinematics, mechanical principles, predictability of results, and the applications of analog models.